I have adored this charming kitchen ever since I first saw it years ago in The Cottage Journal. Over the past year, Andrea from Willow Wisp Cottage (the owner of this kitchen) has become a great friend and also a fantastic leader in our Pure & Lovely Tribe. Her lovely kitchen was designed by another talented friend of mine, Holly Mathis. I couldn’t love Andrea’s home any more! Head over to The Cottage Journal to see more of this kitchen and her home! Congratulations on your new book! I am going to pre-order mine today. I can’t wait! Spring is a great time to release a book about organizing. I have enjoyed being on your launch teams in the past. I will definitely leave some reviews and tell others about your new book. If there is anything else to do, please share. For now I am working on the oils – learning all I can and posting on Instagram. You and your girls are such an inspiration to me. It was fun to see Andrea’s kitchen. 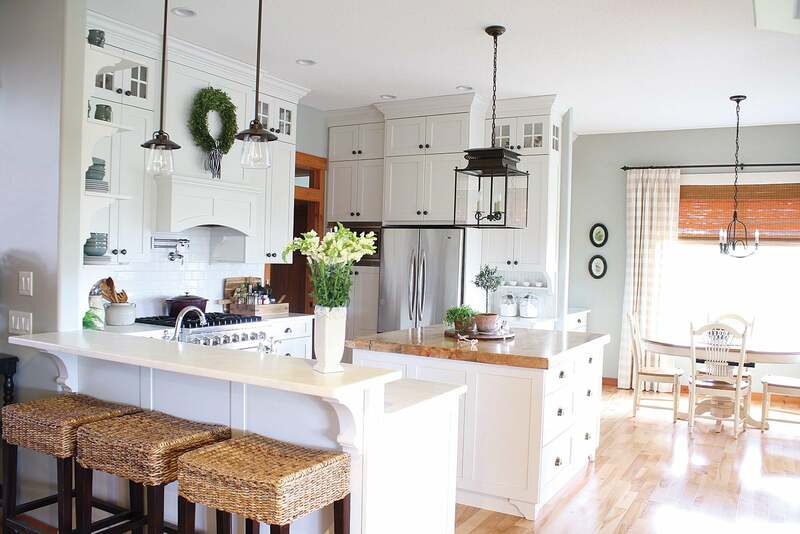 It’s a cool mix of clean, traditional, and farmhouse. Beautiful!